Average wage earners in the United States face two major taxes: the individual income tax and the payroll tax (levied on both the employee and the employer). Although a little more than half of a U.S. worker’s payroll tax burden is paid by his employer, the worker ultimately pays this tax through lower take-home pay. The total tax burden faced by average wage earners in the United States is 31.5 percent of their pretax earnings, paying $17,372 in taxes in 2014, with $8,631 in individual income taxes and $8,741 in payroll taxes. The total tax burden faced by average U.S. workers is the 24th highest in the OECD, below the 34-country average of 36 percent. In the absence of income and payroll taxes and the benefits they provide, the average worker would take home nearly $5,000 in additional annual income for a total of $54,977. Many OECD countries have high payroll taxes, such as France, which places the highest payroll tax burden of 37.9 percent on average workers. In some countries, over 50 percent of workers’ total tax burden is paid by their employers. A significant source of tax revenue for most countries comes from taxes on wage income through individual income taxes and payroll taxes. Most industrialized countries have progressive taxes on income, which means higher-income individuals are taxed at higher rates than lower-income individuals. However, many countries also place a substantial tax burden on average-income earners. While these taxes, especially payroll taxes, pay for major government programs, it is important to know what the cost of these programs is from the perspective of the average worker. Currently, workers earning an average wage in the United States face two major taxes on their income: the individual income tax and the payroll tax (both the employee side and the employer side). The total burden of these taxes equals 31.5 percent of an average worker’s income. Although this burden is high, the average across the 34 OECD countries is slightly higher at 36 percent. 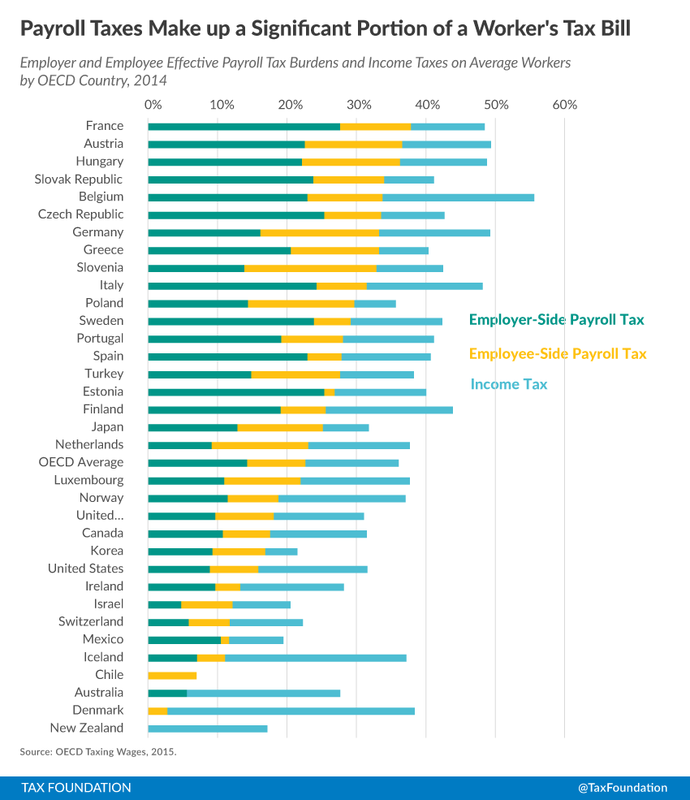 The average tax burden on labor in the OECD is higher due to higher payroll taxes. It’s important to note that the tax burden on workers with children is lower in most OECD countries than it is for single, childless workers with the same pretax income. As indicated previously, there are two major types of taxes that wage earners in the United States pay. First, individual income taxes are levied by federal, state, and sometimes, local governments to fund the general operations of government. Second, governments levy payroll taxes on both the employee and the employer, though the economic burden of both ultimately falls on wage earners. Payroll taxes are meant to fund programs such as Social Security, Medicare, and Unemployment Insurance funds. The most familiar component of wage taxation in the United States is the federal individual income tax. The federal income tax has a progressive rate structure with marginal rates that range from 10 percent on the first $9,225 of taxable income to as high as 39.6 percent on income over $413,200. In 2012, half of all taxpayers fell in the first two brackets, while less than 1 percent of taxpayers paid the top rate. On top of the federal income tax, 43 states and the District of Columbia tax individual income. Local governments in 17 states also levy an individual income tax. The United States levies two separate payroll taxes on wage labor. The first tax is a 12.4 percent tax which is used to fund Social Security (Table 2). This tax is levied from the first dollar an individual earns in income up to a cap of $118,500 in 2015. This cap is adjusted to wage changes each year. On paper, the tax is paid half by employers and half by employees. Workers in the U.S. will see a Social Security tax of 6.2 percent on their paystub, while the employer remits the other 6.2 percent on the employee’s behalf. The second tax is a 2.9 percent payroll tax to fund Medicare. This tax is also levied from the first dollar of income but has no cap. The tax is also split evenly between employers and employees. An additional 0.9 percent Medicare payroll tax applies to wage income over $200,000 (this cap is not adjusted for inflation). Source: Social Security Administration (2015). In addition to the employer-side taxes that fund Medicare and Social Security, there is an additional payroll tax to fund Unemployment Insurance. Unemployment Insurance is a joint federal-state social insurance program that insures workers against an unexpected loss of income due to losing one’s job. The tax that funds this program is levied on the employer. The federal unemployment tax is 6 percent on the first $7,000 of payroll. However, states also set UI tax rates to fund their portion of the program. State UI tax rates and bases can vary substantially. The variation is based on how frequently an individual employer’s workers receive unemployment benefits. If an employer is likely to hire and fire her employees at a higher than normal rate, the employer will face a higher tax rate. For example, Kentucky taxes employers for the first $8,000 of a worker’s wage at rates between 1 and 10 percent. In contrast, Alaska taxes the first $34,000 in wages at rates between 1 and 5.4 percent. The federal and state tax rates are not additive, however. Employers can credit 90 percent of their state tax against the federal tax, reducing the federal rate to as low as 0.6 percent. Although employers remit the check for their share of the Social Security, Medicare, and Unemployment Insurance taxes, they are not the ones who ultimately pay. In the face of higher labor costs due to their share of the payroll taxes, employers can either reduce employment or reduce the wages of employees. Research has found that employers choose the latter and reduce their employees’ wages by the cost of the employer-side payroll taxes. In the absence of employer-side payroll taxes, it is likely that workers would be paid more. This also brings up an important point about transparency. It is true that these taxes go toward funding for Social Security, Medicare, and Unemployment Insurance, which are potential benefits for taxpayers in the future. However, due to the structure of these taxes, more than a quarter of an average worker’s tax burden does not appear on their paychecks. This hides the true cost of these government programs. Total Tax Burden on Labor Income in the U.S.
Every year, the OECD surveys all 34 member nations on their labor tax burdens. The OECD calculates these burdens by adding together the income tax payment, employee payroll tax payment, and the employer-side payroll tax payment of a worker making the average wage in each country. The OECD then divides it by the total labor cost of this average worker, or what the worker would have earned in the absence of these three taxes. This is called the average tax wedge on labor income. In 2014, the OECD found that the average worker in the United States faced a tax wedge of 31.5 percent, which includes income and payroll taxes. The OECD estimated that in 2014 the average U.S. worker paid an effective individual income tax rate of 15.7 percent and an additional 15.9 percent effective payroll tax rate (7 percent on the employee side and 8.9 percent on the employer side). The average worker in this case is a single worker without children who earned an annual income of $50,084. (Chart 1). This annual income is lower than the average labor cost of $54,977, which is reduced by employer side payroll taxes. 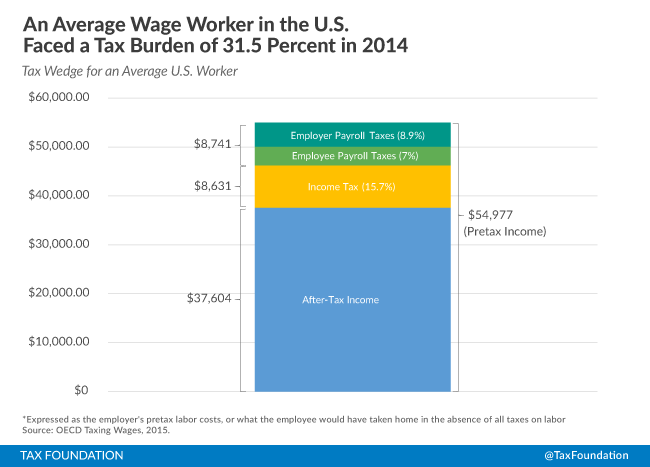 The 31.5 percent tax wedge for a U.S. worker represents an $8,631 average individual income tax bill and an $8,741 average payroll tax bill for a total average tax bill of about $17,372. The result is an after tax income of $37,604. In the absence of these three taxes, the average worker would have taken home $54,977. How Does the United States Compare with Other OECD Nations? A total tax burden of 31.5 percent on labor income in the United States appears high, but workers in other industrialized nations typically face higher tax burdens on their wages. 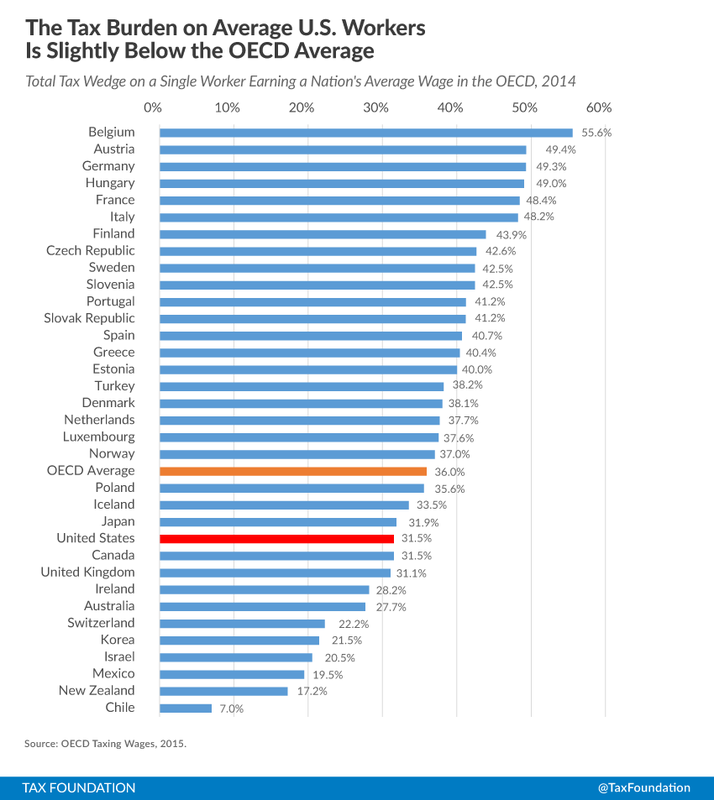 Compared to the United States, other countries in the OECD place a relatively high tax burden on average wage earners (Chart 2). The OECD has an average tax wedge on average income earners of 36 percent. This is about 4.5 percentage points higher than the U.S. tax wedge of 31.5 percent, which ranks as the 24th highest in the OECD. The highest total tax burden on wage income is in Belgium at 55.6 percent, followed by Austria (49.4 percent) and Germany (49.3 percent). The country with the lowest total tax rate on its labor is Chile at 7 percent. New Zealand had the second lowest effective rate at 17.2 percent followed by Mexico at 19.5 percent. As in the United States, payroll taxes in other OECD countries go toward funding social insurance programs. These programs, especially in Europe, tend to cost a significant amount. As a result, most OECD countries’ high average tax burdens on labor are due to high payroll taxes (Chart 3). The average combined (employee and employer) payroll tax rate in the OECD was 22.7 percent in 2014, which was 6.8 percent higher than the U.S.’s combined rate of 15.9 percent. France had the highest combined payroll tax burden of 37.9 percent. This is followed by Austria and Hungary, with effective payroll tax rates of 36.6 percent and 36.3 percent, respectively. These three countries’ payroll tax burdens alone are greater than the total tax burden on laborers in the United States. The countries with the lowest combined payroll tax burdens were Australia (5.6 percent), Denmark (2.8 percent), and New Zealand (0 percent). New Zealand is the only country that doesn’t levy a payroll tax on the average worker. It is also interesting to note that even though Denmark has low payroll taxes, its government still places a relatively high tax burden on average workers through higher individual income taxes (an effective rate of 35.6 percent). In 29 of 34 OECD countries, payroll taxes made up half or more of an average single worker’s total tax burden in 2014. All countries with payroll taxes, except for Australia, Chile and Denmark, split their payroll tax burdens between employees and employers. On average, employer-side taxes tend to be higher across the OECD. The average OECD employee-side payroll tax burden in 2014 was 8.4 percent. Slovenia had the highest employee-side payroll taxes in the OECD at 19 percent, followed by Germany (17.1 percent) and Poland (15.3 percent). Average workers in the United States faced an effective rate of 7 percent. The average employer-side payroll tax burden in the OECD is higher at 14.3 percent. France, which has the highest overall payroll tax rate (37.9 percent), also has the highest total effective employer-side payroll tax rate at 27.7 percent. Estonia and the Czech Republic follow, both with an effective rate of 25.4 percent. Employer-side payroll taxes are less transparent than employee-side payroll taxes, as employers remit the check to the government, but employees pay the cost through lower wages. 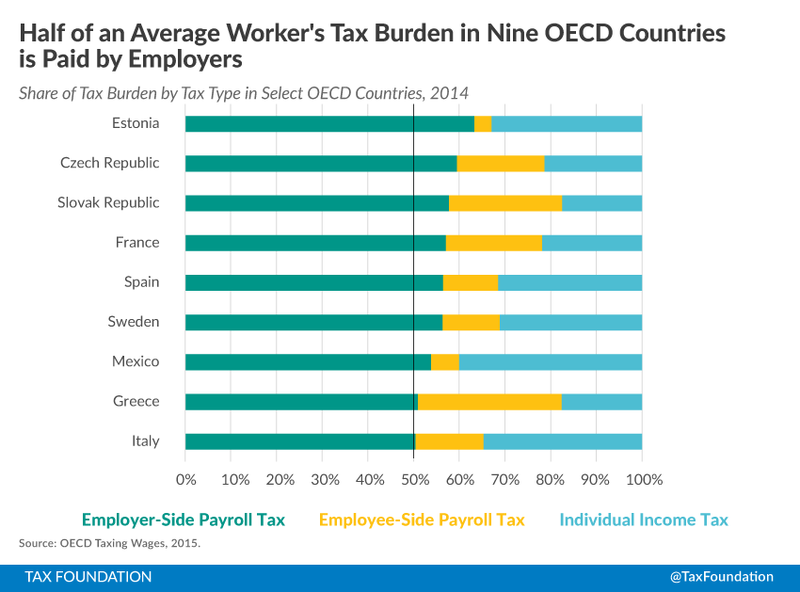 For workers in nine OECD countries, half or more of their total tax burdens were paid by their employers (Chart 4). For instance, France had an employer-side payroll tax rate of 27.7 percent, which was the highest in the OECD in 2014. This tax was 57.2 percent of the total tax burden faced by French workers in 2014. The country whose workers paid the largest proportion of their total tax bill through their employer payroll taxes was Estonia. Their 25.4 percent employer-side payroll tax was 63.4 percent of their total tax burden in 2014. In contrast, the 8.9 percent payroll tax on the employer-side in the United States only makes up a little more than a quarter (28.2 percent) of an average worker’s tax burden. It is also important to point out that the tax burden of average workers varies based on family composition. Most OECD countries provide some tax relief for families with children. Comparing single, childless workers and single-earner families with two children earning the same pretax income illustrates how taxes can differ by family composition throughout the OECD (Chart 5). On average, the tax burden for families (an average of 26.6 percent in 2014) in the OECD is 25.9 percent lower than the tax burden on single, childless workers (an average of 35.9 percent). The United States, with the Child Tax Credit and the personal exemption, reduced the tax burden for families with two children (a rate of 20.6 percent) by 34.6 percent compared to the tax burden on a single, childless worker (a rate of 31.5 percent) in 2014. Lower-income workers with children also benefitted more from the Earned Income Tax Credit (EITC) than lower-income workers without children. New Zealand provided the largest relative reduction of taxes for families with children compared to single, childless workers. The total tax burden of a married couple with two children in New Zealand (3.8 percent) was 77.9 percent lower than the 17.2 percent total tax burden on a single, childless worker in 2014. Mexico and Chile were neutral between families with children and without children. 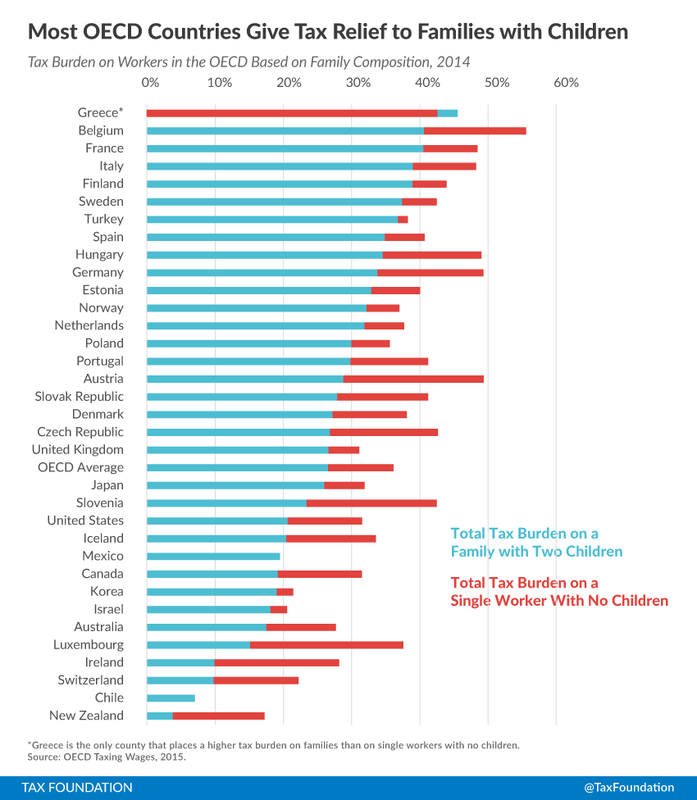 Greece was the only country that levied a higher total tax burden on families compared to single, childless workers. Although the United States and most OECD countries are known for having progressive tax systems that tax high-income earners more than low- or moderate-income earners, a large portion of the tax burden still falls on the average worker. Even here in the United States, which has a lower tax burden than most other OECD countries, average workers end up paying nearly one-third of their incomes to taxes. It is true that governments in the OECD, especially European countries, provide more government programs. However, their workers end up paying a much higher price for them. Source: OECD Taxing Wages (2015). According to IRS data for 2012, 50 percent of all taxpayers had adjusted gross income of $36,055 or below. One percent of all taxpayers had income over $434,682. 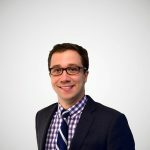 See Kyle Pomerleau & Andrew Lundeen, Summary of Latest Federal Income Tax Data, Tax Foundation Fiscal Fact No. 445 (Dec. 12, 2014), https://taxfoundation.org/article/summary-latest-federal-income-tax-data-0. Tax Foundation, Facts and Figures 2015: How Does Your State Compare?, https://taxfoundation.org/article/facts-figures-2015-how-does-your-state-compare. Gerald Prante & Austin John, Top Marginal Effective Tax Rates by State and by Source of Income, 2012 Tax Law vs. 2013 Tax Law (as enacted in ATRA), Feb. 3, 2013, http://papers.ssrn.com/sol3/papers.cfm?abstract_id=2176526. Social Security Administration, 2015 Social Security Changes, http://www.ssa.gov/news/press/factsheets/colafacts2015.pdf. Joseph Henchman, Unemployment Insurance Taxes: Options for Program Design and Insolvent Trust Funds, Tax Foundation Background Paper No. 61, Oct. 17, 2011, https://taxfoundation.org/article/unemployment-insurance-taxes-options-program-design-and-insolvent-trust-funds. Jonathan Gruber, The Incidence of Payroll Taxation: Evidence from Chile, NBER Working Paper No. 5053, Mar. 1995, http://www.nber.org/papers/w5053. OECD, Taxing Wages 2015, 2015, http://www.keepeek.com/Digital-Asset-Management/oecd/taxation/taxing-wages-2015_tax_wages-2015-en#page527. While the employee-side payroll tax is a combined 7.65 percent, the effective tax rate on total labor costs is reduced by 8.9 percent to account for the reduction in the worker’s taxable income. The total payroll tax burden includes Social Security taxes, Medicare taxes, and Unemployment Insurance taxes. This is the gross income after employer-side payroll taxes. The number is derived by multiplying the OECD measure of the U.S. average labor cost of $54,977 by 91.1 percent (1 minus 8.9 percent). For instance, Belgium and Austria, the countries with the highest tax burdens on wage earners, spend an equivalent of 30.7 percent and 25.8 percent, respectively, of their GDPs on social welfare. See OECD, OECD StatExtracts, Social Expenditure—Aggregated Data, 2014, http://stats.oecd.org/Index.aspx?DataSetCode=SOCX_AGG.